STOCKHOLM: Pork meat from Slovenia has been found in halal-marked salami sold in Sweden, the Swedish National Food Agency said Wednesday. “We are now going to inform the EU about our analyses and follow up with the company that sold this wrongly labelled salami in Sweden,” agency spokeswoman Louise Nyholm said in a statement. “It is unacceptable that products that are labelled halal contain pork meat. There are a lot of people who absolutely do not want to eat pork meat, so it’s important that companies take responsibility and verify that their products are not sold on false grounds,” she added. Pork consumption is prohibited under Islam. The agency did not disclose how much falsely marked meat had been sold or for how long it had been on the market. The Islamic halal method of killing an animal requires its throat to be slit and the blood to be drained. The method is forbidden in Sweden because the animals are not anaesthetised before slaughter. 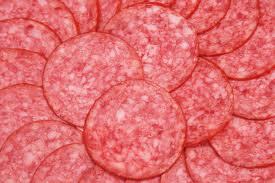 The food agency said the salami contained around 10 percent pork meat, far above the one-percent level usually considered as contamination. The agency said it had tested 99 food products for pork DNA, nine of which tested positive. Eight of the samples contained less than one percent pork, and of those, seven had less than 0.1 percent.